15th Anniversary Artist Experience! Ever wonder how Michael's bronze sculptures are created? Watch a live patina demonstration with fire torch and all on Saturday at noon! Michael Parkes is the world's leading magical realist painter, sculptor, and stone lithographer. His decades of success as a fine artist stand out in the art world where few artists ever achieve success in both the primary and secondary markets. The style and subjects of his artwork merge the realms of the dream world and our perceived reality. His work evokes a mysterious energetic atmosphere, influenced by ancient mythology and eastern philosophy. Join us at the gallery on October 19th and 20th for hors d'oeuvres as Michael Parkes dedicates his exquisite art. What is unusual about Michael Parkes is that in his images metaphysical and spiritual elements are joined into reality. His work evokes a mysterious atmosphere, which can often only be deciphered with the help of ancient mythology and eastern philosophy. In the fantasy world of Michael Parkes, the laws of earthly reality are abolished, and space and time enter into their own motionless communion. It is tempting to speak of a dream world with Parkes, if it were not for the fact that the ‘dream world’ of Michael Parkes surpasses all of our dreams in audacity, freedom and intensity. Born in 1944, Michael Parkes studied graphic art and painting at the University of Kansas and then traveled for three years through Asia and Europe. In 1975, Michael Parkes settled in Spain, where he now lives. Throughout his career, numerous international exhibitions underline the importance of Parkes’ work. Michael Parkes is both a uniquely talented painter and master of the art of original stone lithography. Michael Parkes is the world’s leading Magical Realist. He is a painter, a sculptor, and a stone lithographer. His more than 30 years of success as a fine artist stand out in the art world, where fewer than 1% of artists ever achieve success in both the primary and secondary markets. Parkes’ works are collected by celebrities, important private collectors, and museums around the world; and his body of work has stood the test of time. Parkes continues to create new works, all of which are widely sought after. 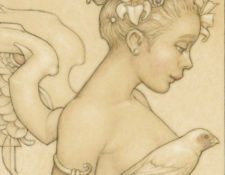 Michael Parkes art for sale can be found on the following pages.